Residency Statement’s Writing Service (S-WS) is the world’s only full service US Medical Residency Personal Statement writing resource for the busy medical professional. Rather than spending hours or days wading through writing on your own, you can work side-by-side with an experienced writer to craft the perfect Personal Statement from scratch. The S-WS service and your Writer will be there to help you through every step of drafting a Personal Statement from brainstorming through our questionnaire, to completing a first draft and finalizing your complete Personal Statement. Residency Statement’s unique Writing Questionnaire was researched and Written to thoroughly cover any potential themes, ideas, or content every Personal Statement needs to give the most complete and positive picture of you. Spend uninterrupted one-on-one time with your very own professional Writer as you work together to complete the perfect Personal Statement. Have any questions or concerns during the Writing process? Leave a message for your Writer at any time in our Messaging System, and they will respond as soon as they can. Your Personal Statement should be a reflection your personality, skills, and life experiences. With that in mind, each Personal Statement is Written entirely without the use of templates or samples to ensure a personalized document. Fill out the comprehensive Writing Questionnaire to the best of your ability and submit your answers. You will be assigned a Writer to work with you throughout the process. Your Writer will begin putting together your Personal Statement right away. The first version of your brand new Personal Statement will be provided to you for you to review, ask questions, and make any comments. Based on your feedback, a finalized copy will be provided for your use throughout the Residency Match Season. Why choose the Writing Service (S-WS)? If you would like the chance to work with a professional writer to complete your Personal Statement in the most efficient and effective way possible-- the Writing Service is what you’ve been looking for. Whether you need to start from the beginning, or you have an incomplete draft to finish, our talented Writers will help you through every step of the process. It’s easy! All you have to do is complete the Writing Questionnaire and work with your Writer to complete your Personal Statement. How long does the Writing Service take? The total processing time for the Writing Service is 7 to 10 days. You may select the Expedite option to reduce the processing time to 3 to 5 days if you need your Personal Statement right away. How did you pick questions for the Writing Questionnaire? Each question in the Writing Questionnaire is included to help draw out the best material to build your distinct Personal Statement. The questions themselves were each carefully crafted around the most important information your Writer will need to know in a wide variety of subjects related to Medical Residency Personal Statements. Does the Writer just write my Personal Statement for me? You will collaborate with your Writer to produce the Personal Statement. First, you will give the Writer all of the raw materials they need to build your document by answering the Writing Questionnaire. Then, the Writer will put it all together into your Personal Statement. Can I use language I found on the internet to fill out the Writing Questionnaire? No. We get to know you through your answers to the questionnaire. 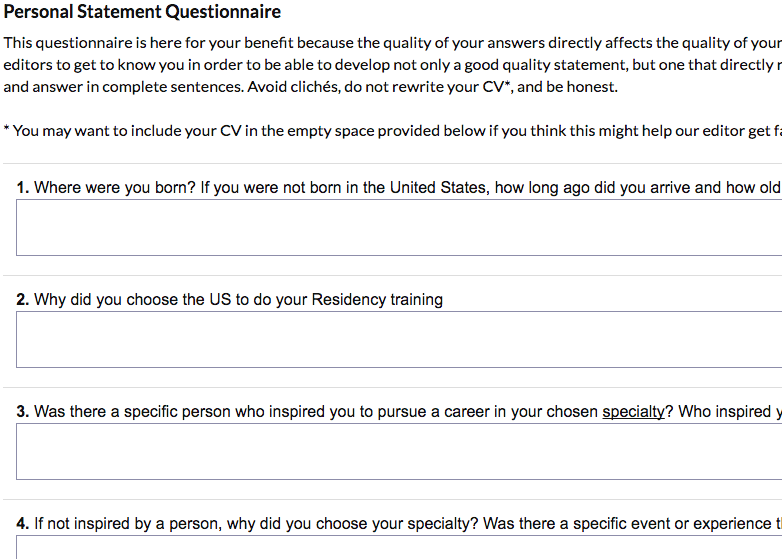 The answers to the questionnaire must be written by you, in your own words.